In the second and final installment, a kidnapping at a prominent wedding in Karen, a gun in court and why Kenya isn’t helping her citizens in Juba. 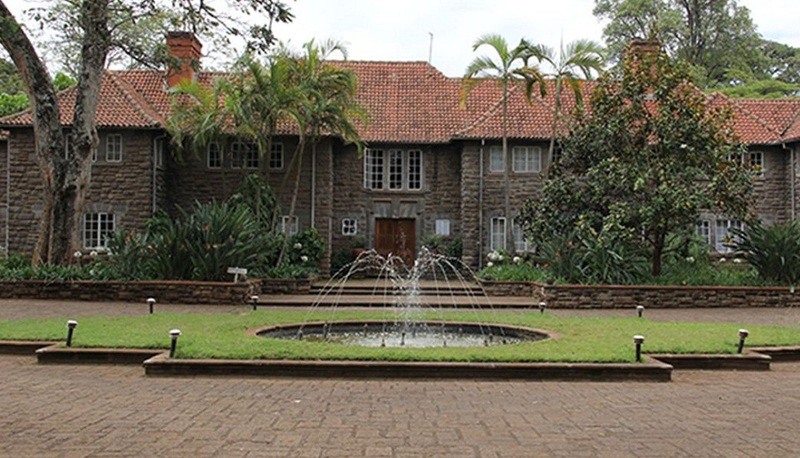 Marula Manor is a 20-acre estate in Karen with a colorful and dark history. One of its earliest owners, Sir “Jock” Delves Broughton, was charged with the murder of Lord Errol in 1941. Errol’s body was found just up the road from the estate; he had just delivered Jock’s wife, Diana (the future Lady Delamere), home before he was shot in his car. Today though, Marula Manor is one Nairobi’s top wedding venues. It has retained most of its colonial buildings, and the landscape is still mostly untouched but for maintenance. Most of it still feels and looks like it did on that cold night in 1941 when someone shot Lord Errol in his Buick. It is the perfect set for a wedding themed around grand ideas of an English wedding. Surrounded by willow trees, the manicured gardens have played host to some of Kenya’s most prominent weddings. On October 2nd 2015, just a few weeks before Wazome’s mum made the trip to Juba to see her son, such a couple held such a wedding there. It was probably Kenya’s first truly celebrity wedding. The bride and the groom, Betty Kyalo and Dennis Okari, are both prominent newscasters. In the weeks leading up to the wedding, the hype of the ceremony turned into a giant billboard. Advertisers fought for space, even on the couple and their wedding party, down to the vehicles the two used to get to Marula Manor. RMA Motors provided a Jaguar XJ and an XF for the day. Darling Kenya custom-made a hair extension for Betty, and supplied extensions to her bridal team. Although the marriage would fall apart just six months later, that Saturday in October 2015 was the culmination of one of the most anticipated social events of the year. One of the 150 names on the official guest list was Susan Chaat, John Agou’s wife. As she dressed up for the wedding, Susan was worried. She had been stopped by Kenyan police a few times. They always seemed to know her. They had searched her penthouse on Riara Road and at least once, slapped her. The last five months had begun to feel like a bad dream. With a husband in jail and a son to take care, Susan needed a win. She needed to do something different. Marula Manor is hard to find if you’ve never been there. It’s one of the many driveways on Marula Lane, a nondescript, lonely road that branches off Karen Road. To get to it, in this unmarked, high class suburb, you have to actually know where it is. Susan’s driver got lost that day as he drove Susan, her son, and her sister to the wedding. While he stopped to ask directions from passersby, his phone rang incessantly. It was his wife, enquiring where exactly he was and when they would be getting to the wedding. He brushed it off, instead focusing on getting his passengers to the top-billed wedding. When he eventually took the right turn from Marula Lane onto the long, rocky driveway that leads to the estate, everything made sense. Standing next to the guard at the gate was a small group of men, obviously cops trying too hard to fit in. When the driver stopped the car to be searched, the group approached them. One, a South Sudanese man, asked Susan to step out and into their car. Realising she was out of options, she told her sister to go on ahead. She would be back before the wedding started. It was probably just another interrogation; enquiring where Agou had hidden all the money he had stolen from the president’s office. By the time anyone realized what that small stop at the Marula Manor gate meant, Susan Chaat had crossed the border with her captors. Her name was added on the charge sheet, following her husband’s. Eight months later, it was on the judgement sheet. She too, would spend the rest of her life in jail. The first person to be arrested on May 29th 2015, at Airport Business Center was John Agou. He was carted off in the morning by his colleagues, promising his employees he would be back. The police came back without him and arrested everyone, employees and unlucky customers combined. They made small talk, with one even asking Ravi to order for him a tablet from Nairobi, as they packed up everything they could see. Only one employee who had stepped out for lunch just seconds before survived the sweep. Another, an Indian accountant, had been in Juba for barely a week. Ravi Ghaghda had flown in to Juba just the day before, on Thursday. His father told me he had asked him to wait until the next week but Ravi had insisted he had to go back to work. Three of the other Kenyans in the company-Chuma, Wazome and Kia-had made the decision to quit Click Technologies the next week. The pay was bad despite all the government contracts and work floating around. Just days before May 29th, the three bought three bus tickets to Nairobi marked 4th of June, the Thursday after they were arrested. Wazome had already shopped for his mom and delivered the packages to the bus line office. When he didn’t show, the busline went ahead and delivered the shopping to Esther in Nairobi. But that was before the quiet morning of May 29th, when their workplace was turned upside down. Click Technologies was just one of the theaters of what would turn out to be an intricate web. It wasn’t just Agou and his employees who were arrested that day. The third and fourth names on the eventual charge sheets were Mayen Wol and Yel Luol. Mayen was the Executive Director in Kiir’s office, while Yel was the Chief Administrator. They had both been suspended before, in 2012, after a suspicious burglary in the president’s office. The door was locked, the story goes, but the money was missing. On May 29th, as Click Technologies crumbled, investigators raided both Mayen’s and Yel’s homes. In all the sweeps, despite months of investigations, there was no arrest or search warrant. John Agou, the investigators said, had requested an unauthorised payment of $1 millionfrom South Sudan’s Central bank. Given a recent freeze on such heavy withdrawals-partially triggered by Gadaffi’s scam and the war-the request drew interest. Agou had forged President Salva Kiir’s signature and stamps to request for the payment. At Click and at the homes of Mayen and Lol, the police found republican seals and papers with the president’s letterhead. But this wasn’t unusual; for years, Agou and Gadaffi had printed most of the papers in the President’s office, first through a company called Jupiter Printing. But the transaction that triggered the investigation seemed to have been one of many, most of which had already gone through. In total, the investigation committee said, John Agou had stolen $14 million. He was part of a complex web of insiders in the presidency, and had used his power and education to beat South Sudan’s weak financial controls. The court case eventually started in February 2016, nearly a year since the sweep of Click Technologies on May 29th. 16 people were eventually charged with multiple counts of fraud and forgery. They were transported to court in heavily guarded armored vehicles. There were roadblocks and elaborate security measures, even within the courtroom. The plenary had more National Security agents than civilians. Over its first weeks, a pattern emerged: defense witnesses always came back the next day after testifying, to change their original testimony. In almost all the images of the trial, John sits at the back, next to his wife. They are mostly hidden from the camera, with only their heads visible. The four Kenyans always sit in the front pew, every time, as if being paraded as the faces of the scandal. Yet the lawyer who eventually took up the case routinely brought up the fact that the Kenyans were never mentioned in the testimonies. Ravi had made a payment request to the President’s office for some items including mosquito nets. This was brought up, but wasn’t part of the case itself. 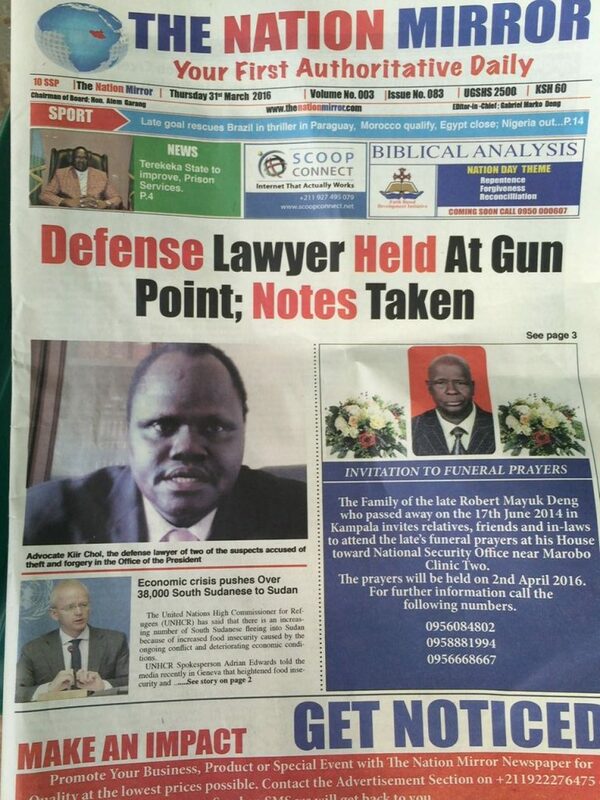 John Agou’s first lawyer, Kiir Chol, pushed prosecution witnesses on the investigation and the haphazard arrests and searches. 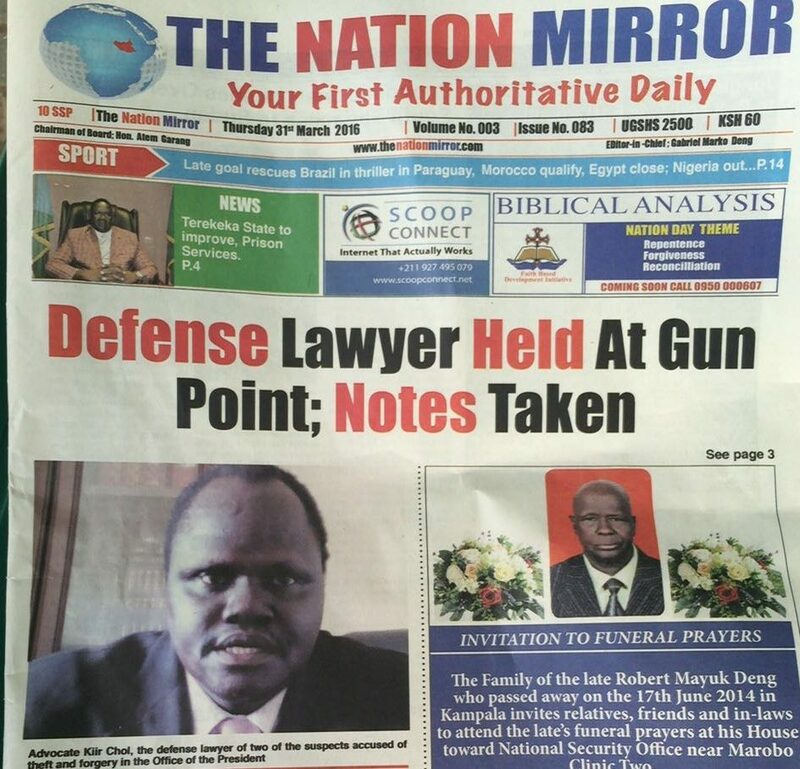 In late February, just a few weeks into the job, Kiir Chol was threatened at gunpoint in open court, in full view of the judge, Ladu Armenio. His tormentors, the policemen, wanted the notes his clients had been passing to him in the courtroom. Chol quit the case in protest. The investigators said that Kia and Wazome were “involved in the forging of stamps.” The extent of their culpability was never determined, and they were never properly questioned. Over the five months of the trial, it became clear that something else was at play. The kidnapping of Susan Chaat from Nairobi seemed to have been an attempt to up the ante and force Agou, like his cousin before him, to refund the money. But the narrative became that this wasn’t about corruption, it was about revenge. That while Gadaffi was locked up in Jebel, John Agou built a company and took over his brother’s contracts with the government. He cut him off from a business they had ostensibly built together, and in revenge, Gadaffi exposed the machinations behind the contracts. Mayen’s assertions in court that this was Arthobei Gadaffi’s doing included one interesting nugget; that it had all started with an article published online in July 2014. It was in fact a rather thrilling series of articles and replies published under pseudonyms on the South Sudanese news site, Nyamile.com. The first, published by a Dr. Thon Awan on July 7th, 2014, named John Agou, Mayen Wuol, Yel Luol and Kondok John Aguek as an insider conspiracy that was robbing the presidency blind. It was titled “Corruption in the Office of the President.” This was 10 months before the sweep of Click Technologies, and provides vital clues to the backstory behind South Sudan’s most prominent court case. In February 2014, Dr. Thon wrote, Yel Luol had asked for $12 million to be transferred from the President’s special account to a trust fund of an organisation that had Yel as the chair and John Agou as treasurer. The money was quickly transferred across several accounts, with USD 2 million being sent to a trust fund in Susan’s and her son’s name. Dr. Thon Won signed off as “Dr. Thon Awan holds a PhD in corruption and embezzlement, University of Yel and Mayen.” The byline seemed also tongue-in-cheek, and meant to actually taunt the four of them to try get back at him. On July 24th, Dr. Thon posted a reply to the reply, identifying Dr. Anguie as John Agou. He paints himself as driven purely by patriotism, and even thanks John Agou for “stirring up a debate on corruption.” He then outlines a series of dossiers to be released in four parts, complete with documents. A few of those documents made it online, mostly showing requests for transfers by Mayen and Yel. Then there was silence for nearly a year. In his defense, Mayen also said that other than the article online, Gadaffi had moved to Kenya and then sent an dossier to Thomas Ruoth, the Director General of External Security. It was this dossier that triggered the investigation, and informed most of the angles the investigators sought. Gadaffi denies all this, terming it all a wild dream fit for a movie script. He admits he hasn’t been back to Juba in more than a year, and paints himself as a man only interested in the truth. In fact, he denies almost everything, including ever being arrested. He denies the Daffy International link repeatedly during the interview, despite its being widely reported on South Sudanese media. For young elites like Arthobei and John Agou, Nairobi has always been a second home. They are part of South Sudanese refugees living and working in Kenyan cities; a testament of South Sudan’s informal moniker as “Kenya’s Ninth Province.” Most of SPLM’s leaders including Riek Machar, John Garang and Salva Kiir have lived in Nairobi, and continue to own real estate and other investments in Kenya. 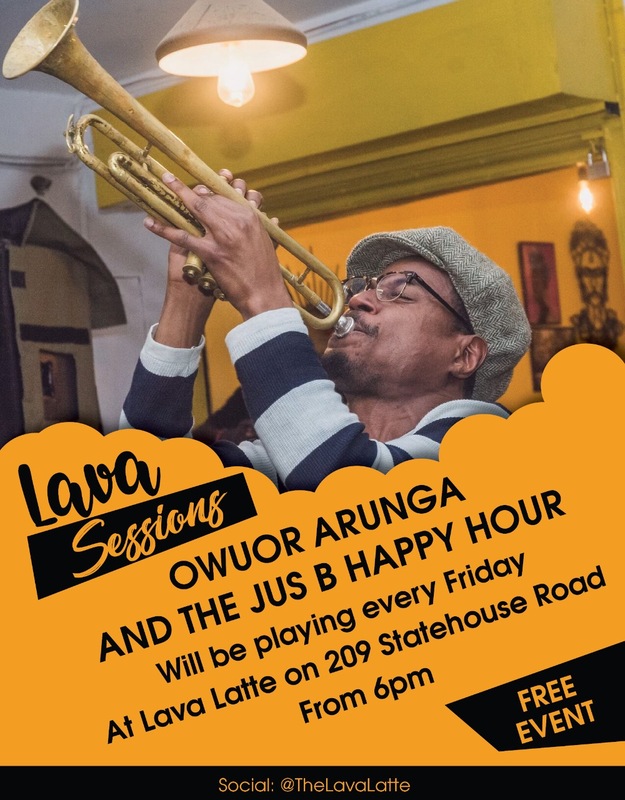 Some areas of Nairobi and Nakuru are informally known as “Little Juba” because of their high-worth South Sudanese expatriates. So if the two countries are so intricately connected, why was Kenya reluctant to ask for a fair hearing at the very least? Kenya was deeply involved in South Sudan secession politics. President Moi invited Riek Machar and John Garang to Nairobi after they fell out in 1993. The peace process with Khartoum begun around the same time, escalating in 2002 under President Kibaki and culminating in the Machakos Protocol, signed in 2005. Kenya also sent several cadres of civil servants to train the new government after the July 2011 referendum. But it wasn’t all altruism. In the background, Kenya pushed to provide a sea route to the new, landlocked nation. The project, LAPSSET (Lamu Port Southern Sudan Ethiopia Transport) is a gateway for both Ethiopia and South Sudan. It will include, once finished: oil pipelines, roads, airports, resort cities, an oil refinery and a railway line. Its success depends on South Sudan accepting the route even after one of its close allies, Uganda, chose Tanzania for its oil route to the sea. All these might explain, partially at least, Kenya’s reluctance to even ensure that its citizens got a fair hearing in the most important corruption case in South Sudan. “There were 8 Kenyans initially and four were released,” Washington Oloo, the Director of Consular Affairs in the Ministry of Foreign Affairs, tells me without clarifying if it was through the Kenyan government’s intervention. “While we can’t interfere with the sovereignty of the South Sudanese government, we’ve also objected to the sentence,” he continues, “this wasn’t not a capital offence.” What he doesn’t say, and what most families repeatedly accuse the government of, is a seeming reluctance to even try get some semblance of justice. On their visits last year, the different families were told “We have no use for these ones, we just want our money back.” While no one explained exactly how they were connected, they figured that Agou, like his brother, had used Kenyan banks for his transactions. The prosecution did list 9 names, about half of which were Kenyan, that Agou used to source for jobs and process money. 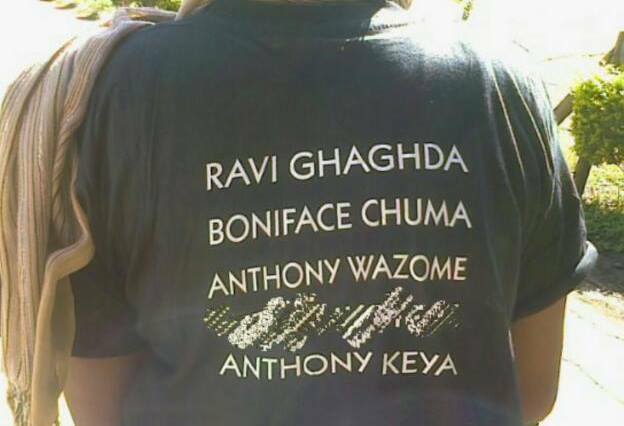 They included Moses Macharia, Moses Kibuku and David Kipkoech. Kibuku or “Bush” seems to be the only real person connected to the case on the list; every other name is made up or unrelated. The trust fund mentioned in the July 2014 articles was also set up in Kenya and might be the reason why Susan Chaat was kidnapped. There’s something about people who suffer a common misfortune that binds them. As we sit around the table at Jumuiya, with different family members narrating how messy the last 13 months have been, they feel more like one big family than four different ones. They have attended countless meetings together, organized protests, and a hunger strike. It was the hunger strike outside Old Treasury Building, which houses the Ministry of Foreign Affairs, that eventually won them the October visitation. The uncertainty of detention is like tragedy. For the people involved, time stops. They remember the dates that changed their lives. The places. The people. They narrate the stories of how it happened, and what happened, with an unnerving unease. It doesn’t get easier every time they do, and it shows. 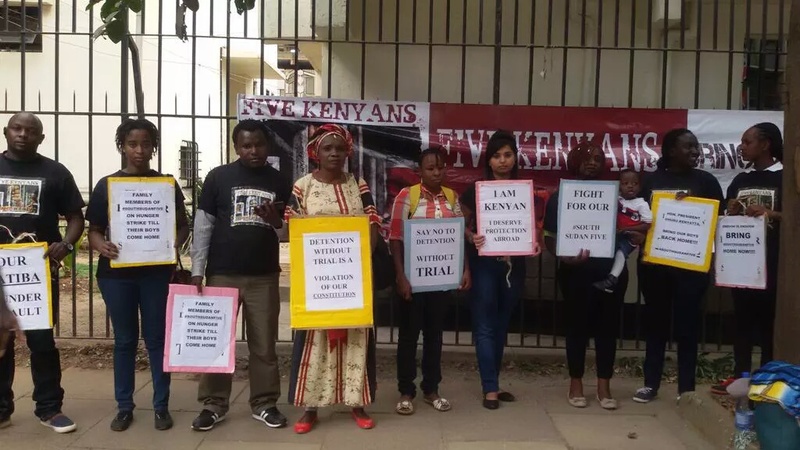 The families of the Kenyans jailed in Juba stage a hunger strike outside the Old Treasury Building in Nairobi which houses the Ministry of Foreign Affairs. While officially, Kenya and South Sudan are bosom buddies, the story on the streets is different. In 2012, there were more than 50 Kenyans in prisons around Juba alone. Most were there for lacking valid travelling documents and being involved in shady deals. That same year, 15 Kenyans were killed by Sudanese nationals. The year before that, in 2011, Kenyan 22-year-old university student Noah Muruny was arrested while napping under a tree in Tongpiny, Juba. He ended up staying in a cell in Juba Central Prison for more than 2 years, without ever being questioned or tried for anything (he had overstayed his 3-month visa). Washington Oloo tells me that the accusation goes both ways. “We are also accused of mistreating South Sudanese here. And no, Kenyans are not targeted in South Sudan.” It’s a difficult point to defend, but I prod him on what is supposed to happen if a Kenyan is arrested anywhere in the world. Cleland Leshore, Kenya’s High Commissioner to Juba, has also asserted that point, telling the Sunday Nation that “We have an option of negotiating extradition and exchange of prisoners’ agreement, or initiate a high-level political intervention into the matter.” But Cleland’s record in Juba has been nothing but lackluster. The families of the Kenyans point to him specifically for being lax and passive, even in finding representation for the Kenyans. They also point to the fact that his officials at the Kenyan high commission in Juba refused to accompany Ravi back when he had been released in July last year. At least once, in October 2013, Leshore and the high commission have been accused of complicity in the arrest and deportation of Kenyans in South Sudan. When he was arrested then, a man called George Githinji was told he was being investigated for sabotage at the behest of the Cleland Leshore. The two of them had had an argument the day before around the former’s role in highlighting the embassy’s laxity in assisting Kenyans in Juba. As South Sudan erupts again, Kenyans in its towns and cities have found themselves trapped, again. It took the intervention of Red Cross to start evacuating Kenyans from Juba, after more than 15 Kenyan truck drivers had already been killed in a matter of days. The fate of those in South Sudan’s jails remains uncertain. “Life has stopped for us,” Tejal Gaghda, Ravi’s elder sister, says, looking exhausted,” Nothing can go on until Ravi comes home.” True to her word, Tejal has dedicated the last year and a half to finding ways to get her brother back. She has met everyone there is to meet, including Raila Odinga who called Salva Kiir (he was in a meeting, so his PA picked up). All her phones have been bugged and a few of the people she’s reached out to have gotten death threats. The high profile nature of the case and the presence of some of its players, and possibly money, in Nairobi has made it dangerous for everyone involved. “It feels like a dream. An unsolvable problem,” says Tejal Gaghda a few evenings later when I meet the entire Gaghda family. Ravi’s mom says nothing during our interaction; at some point she asks her husband to take her home. It has been a long day, her daughter tells me. But I catch a glimpse of that sadness I saw in Wazome’s mum a few days earlier. She can’t bear hearing this story again, so she leaves. “It feels like a dream,” those words stick with me. There’s something about this entire story, even to the people in the middle of it, that feels surreal. Gadaffi himself refers to it as a “wild dream” about 12 times during our 41 minute conversation. Edited by Chris Mungai, Editor, Africapedia.